As with all self-help/motivational style books, any straightforward review will necessarily fall short without 'experiencing' the book as it is meant to be experienced. 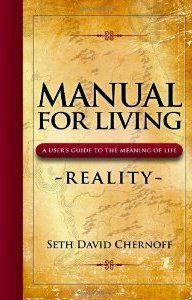 In this case, 'Manual For Living' is written in bite-sized clumps of wisdom meant to be dipped into as appropriate. Right from the start, as if to ward off book reviewers, the author warns against reading it straight through. Which, of course, is exactly what I proceeded to do. The book seems to have many aims, but centrally it tries to build inner strength and positive perception of self within the reader. It reminds me of a Taoist or Buddhist wisdom book, although the lifestyle at the focus of the book appears to be that of a middle-aged American undergoing a midlife crisis. The philosophical perspective is certainly quirky. I suspect that New Age Spirituality offers an integration of an underlying Christian tradition amalgamated with acceptable Eastern influences. In this book, nothing is entirely defined from a religious point of view, but there are concepts like reincarnation washing about alongside service to community and God. Perhaps this is a modern form of Gnosticism, although I also detected neo-Platonic ideas, too. It's like trying to make sense of a complicated wine from an unknown vineyard. The nearest I can place this vintage for comparison is Rudolf Steiner. Again, without explicitly setting out the idea, the 'lessons' of each chapter would be good focus points for meditation. The author wants us to be conscious of the moment we are living in - to immerse ourselves in the present. He picks apart the treadmill of modern existence and offers, guru-like, an alternative vision of the perfect life. However, the work-life balance we all desire, and that he advocates so strongly, is not just a simple 'choice' for most people. Perhaps I was lucky to recognise this 'choice' in my early twenties, rather than my forties or fifties. I made a very early decision to set aside career ambition to look after my children at home, whilst working part-time in a line of work below my potential (I'm in my 14th year of part-time work now and am still doing the same job I did when I started, which is an unfortunate but accepted part of the sacrifice). It's not an easy thing to do, I can tell you. Society's expectations of you run contrary to this choice, and even within one's own family there is resistance. So I understand the sentiment of the book only too well. I'm just not sure it's that simple to achieve, or even so benevolent an outcome. At the end of the day, as my wife often says, no one lies on their death-bed wishing they spent more time in the office. People caught on the career treadmill (that in the US often requires sacrifice of just about everything else in their lives) risk putting all their happiness eggs in one basket. The material rewards offered are often illusory in terms of real worth. We all know this at heart, although the addiction to bigger houses, faster cars and bigger TVs is a hard one for most of us to give up. Simply telling us to rethink our lives can come across as something of a platitude. We also don't critique the nature of our society enough, either. As Madeleine Bunting observes, we have become willing slaves within a great societal machine. The modern Anglo-Saxon society, whether in the US or UK, demands a strong work ethic, and sets itself against a healthy work-life balance. The French have a better philosophy of Life, although it pains me to say it! But 'Manual for Living' is not a revolutionary text. Change is advocated at individual level, in a very American kind of way, to achieve 'greatness'. And if change is not possible (i.e. the boss doesn't take kindly to your idea of taking some time off to be with your kids) then Seth David Chernoff notes that we should simply live in the moment. Presumably at work. But we are also living a faster-paced life than ever before, where our privacy has been eroded beyond all conception by mobile phones and social-networking, and the requirements for us to succeed within this complex society have never been greater. A 'Manual for Living: Reality' offers us the opportunity to step away from that complexity and bustle, and understand what really matters. A timeless wisdom that is more relevant these days than ever before. Subtitled "A User's Guide to the Meaning of Life "